This model is fitted with aluminium die-cast parts having utmost clarity. 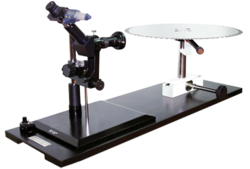 While our range of student microscope comprises of stable and robust stand, it has a built in horizontal graduated mechanical stage (120mm x 120mm) with easy adjustment for slide manipulation up to 40x75 mm. Body - Trinocular Head inclined at 45-degrees with inside analyser attachment. Nosepiece - Quintuple revolving nosepiece with accurate centering & positive click stops. Stage - Large Co-axial Mechanical Stage of size 100mm X 120mm for X-Y movement of specimens. MAGNIFICATION : 20 x to 60 x. FIELD OF VIEW : 8mm. Built in Illumination with transmitted and incident light. Dioptric adjustment system provided on right eye tube stereo Binocular hand rotatable through 360°. Rack & Pinion system for fine focussing. Rotatable automatic objectives for quick changing, Preset specimen in focus even on changing objectives. We are a reputed entity, engaged in trading a qualitative array of Inspection Microscope. World-class materials microsopes for high precision inspection and analysi best optical performance in a small footprint. . .
• siedemopf cbservation head maned a 45. • photclube for nitro photography. • dower asluarnent ring on ocul3r . 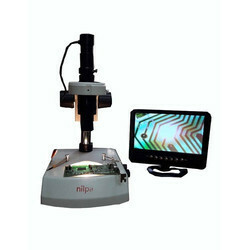 As per the variegated requirements of our clients, we are offering a broad collection of Semiconductor Inspection Microscope. This unit is manufactured using excellent quality raw material and latest technology by our skilled professionals. Field of View : 8 mm. diameter. Mainly recommended for advanced studies in Biomedical / Botanical / Zoological / Enternological & General Medical Laboratories.